Please accept my blessings. I am in due receipt of your letter dated August 9, 1976 and the enclosed daksina and pictures of the murties in New Dvaraka which I am having framed and put on my wall here in Bombay. The real ocean of mercy is Krsna and it is the duty of the spiritual master to tell his disciple to come to the ocean and be happy. The spiritual master's duty is to lead the disciple to this ocean. I am trying my best and if you try to follow surely you will benefit. 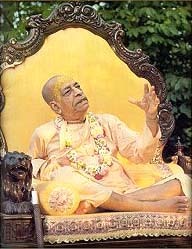 Bhaktivinode Thakura has sung, Krsna sei tomara, Krsna dite para, tomara sakati ache. Ami ta'kangala, krsna krsna boli, dhai tava pache pache." "Krsna is yours and you have the power to give Him to anyone you wish. I am poor and wretched and running behind you shouting Krsna, Krsna!" Krsna is unlimited, no one can catch Him, but if someone follows the parampara, He agrees to be captured. Everyone is afraid of Krsna, but Krsna is afraid of Mother Yasoda. That is Krsna's special mercy. I hope this meets all of you in good health.